We recently announced that due to the phenomenal demand from their clients, that Kent-based James Villa Holidays, the UK’s largest villa tour operator had requested additional detached Villas and Cottages to add to their rental portfolio exclusively contracted with Desert Springs. This week, Desert Springs was host to Jo Richardson, Product Executive of the Contracts Department of James Villa Holidays Ltd and three members of their Sales team; Stephanie Richards, Alexis Bull and Lisa Warne. 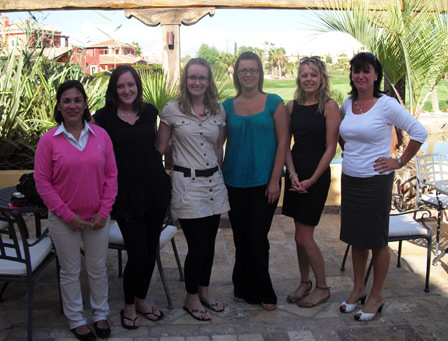 From Left to Right: Lodge Sales Carmen Alvarez, James Villa Holidays Sales Team Members Lisa Warne, Stephanie Richards & Alexis Bull, James Villa Holidays Product Executive of Contracts Department Jo Richardson and Brigid Irwin of Playas del Almanzora SL Property Management. “Personally, this is my third visit to the resort and we had already sent two members of our Sales team to Desert Springs for an educational visit. Even in the technological world within which we all live and the readily available access to property rental websites such as our own, and the information they contain, 40% of our clients wish to deal directly with a member of our Sales team to discuss the resort they are considering visiting for a holiday in detail. As such, we feel it is imperative that our Sales executives can talk with authority from their own personal experience, not only in respect of the quality of the properties available for rental but also the restaurants, on-site staff and facilities available at the resort, as well as the area in general. During their visit, the James Villa team stayed in resort accommodation and carried out a full resort educational with Desert Springs departmental managers and an area tour.